Why would anyone try to break into a heavily defended citadel? For the lashings of loot inside, of course. But you're different, you're in it for the kicks (just as well considering the low exchange rate of computer money!). The treasure trove is protected by four multiloaded fortresses: levels one and three are vertically-scrolling, the others horizontally-scrolling. All show the ship side-on. To help you there's the customary power-ups: collecting one gives you triple fire, a second gives you a drone. In team-play mode player two can control this. A third power-up briefly changes you into an invulnerable eagle. 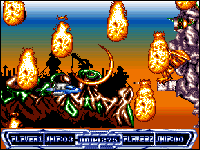 Venom Wing is a professional production using the Amiga to its best with impressive mega-guardians, extensive use of colours and shading, and masses of smoothly moving aliens swirling in precise formations. But the concept has been done to death before. It smacks off Amiga R-Type and the style of Konami coin-ops but it's even harder than them. Inevitable perhaps, since there's only four levels (somewhat disappointing but each level, bar the first, is reassuringly long). A technically clever reworking of the traditional shoot-'em-up, Venom Wing should please Amiga owners eager to show off their machine. It's overload time with this one, a shoot-'em-up which really pushes the Amiga. The blitter is used almost constantly, with several huge aliens being thrown around. Then there's the numerous swirling alien formations where each alien is intricately detailed and animated. All this combined with the vivid colour scheme and good sound FX almost obscures the fact there isn't anything particularly new about the gameplay. But at £20 it's a good buy and makes programmer/artist Pieter Opdam someone to watch out for. No plans for a C64 game. Two continue-plays, high scores saved to disk and okay Psygnosis-style intro. Alternate and drone two-player modus. Technically extremely impressive, parallax scrolling, some impressive baddies and slick presentation. Beautiful intro music, good FX. ...only four levels, but apart from level one they're all big and very tough. A fierce shoot-'em-up which shows off the Amiga in fine style for just £20.